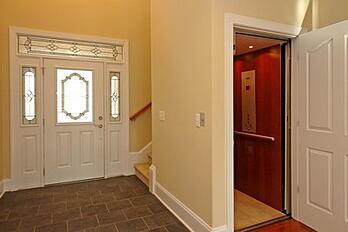 What's in a Universal Design Home? 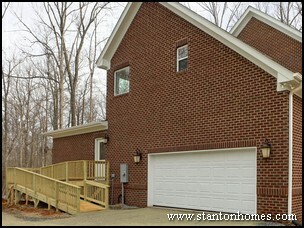 A Universal Design home is focused on ease of use and flexibility - for homeowners of any age, status, and ability - for safety and comfort in a home that does not sacrifice visual appeal. 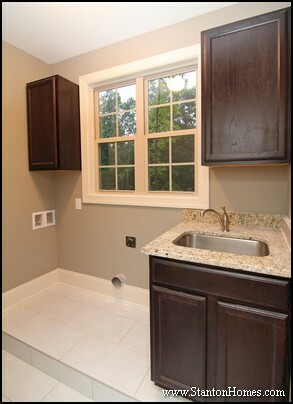 Universal Design features can be described in the two most used rooms of the home: the kitchen and bathroom. 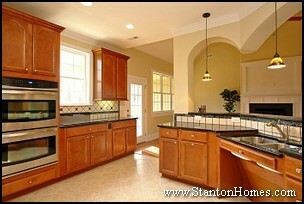 - Induction cooktops - there are no open flames, and the cooktop temperature generally remains neutral. 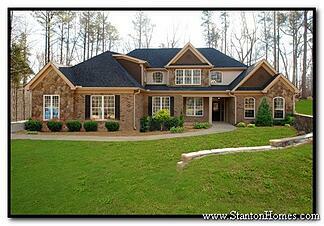 The custom home pictured here - the Linda - features an induction cooktop. 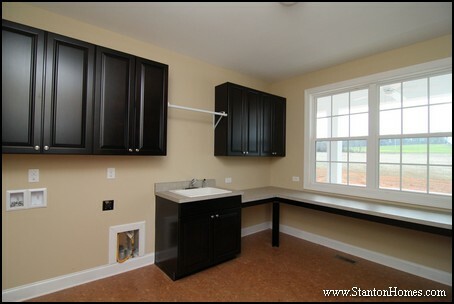 - Empty space under countertops, sink, or cooking areas - allows for seated (or wheelchair) access. 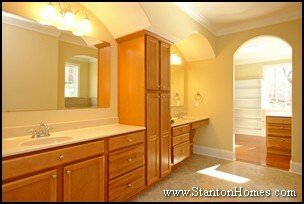 - Lower countertops and sinks - allows for seated (or wheelchair) access. 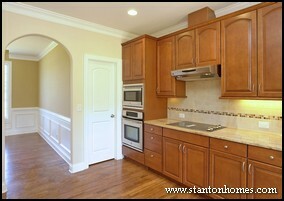 - Adjustable-height countertops - allows more flexibility for various kitchen users. 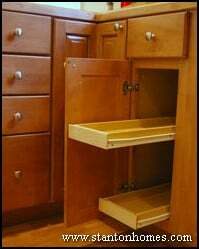 - Roll-out shelves or drawers - allows visibility and easy reach. 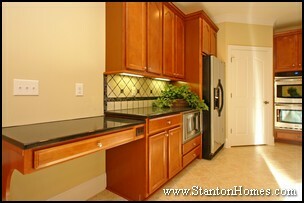 - Pull-out counter underneath a built-in wall oven - allows easier transfer of hot items from the oven. 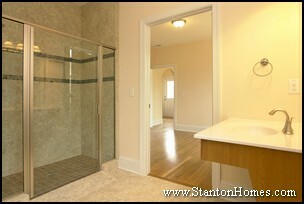 - "Hands-free" or touch faucets - allows for easier use of faucet. 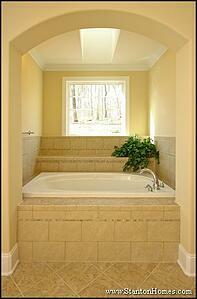 - Tub ledge or seating area - easier movement into and out of the tub. 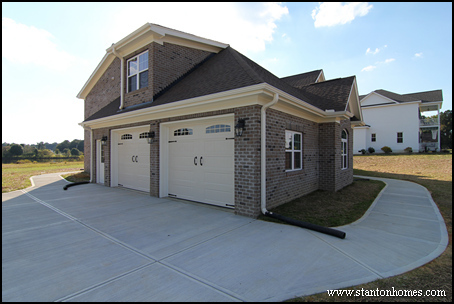 Pictured here is a custom home - the Dugan - with universal design bathroom features such as a wide tub seating area and separate roll in shower. - Textured flooring - preventing against slips on slick, wet surfaces. 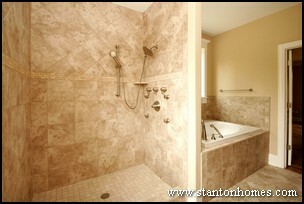 The Dugan includes textured tile flooring. 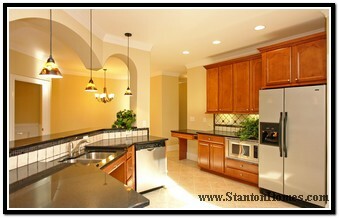 - Night lighting - to help safely navigate a dark room. 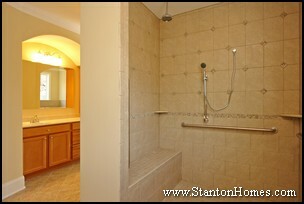 - Grab bars - manufacturers now offer coordinating grab bars, faucets and shower fixtures. 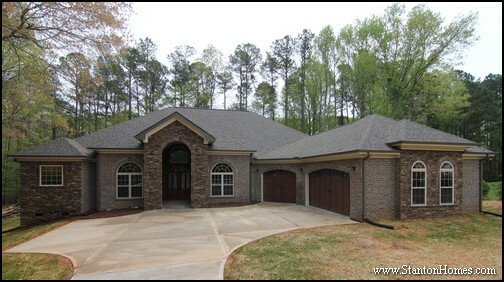 Pictured here is a custom home - the Terrell - with universal design bathroom features. 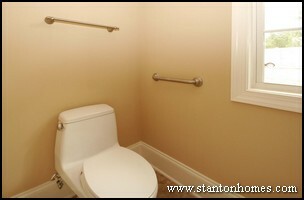 This bathroom contains matching towel rack and grab bar. 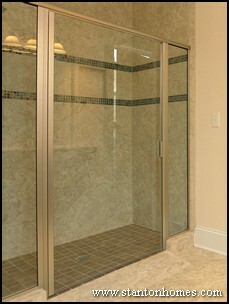 While these bars are a simple brushed nickel design, manufacturers offer many "loud" choices as well. 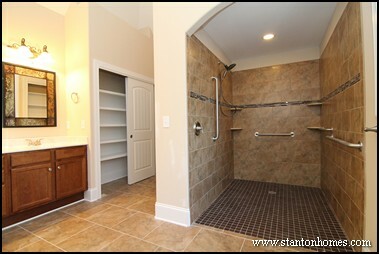 - "Zero-threshold" shower bases - the shower entrance is flush with the bathroom floor, allowing for wheelchairs and generally easier access. - Removable bench - can be used in the tub or shower. 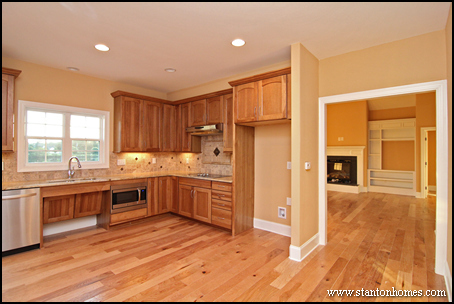 - Contrasting color design - to help distinguish where surfaces change. - Hand-held/maneuverable faucets - to make bathing, or helping someone else bathe, easier. 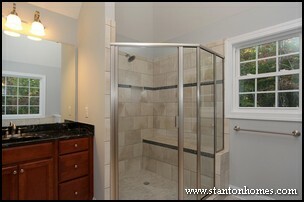 The Terrell master bathroom - pictured to the right - features secondary shower and tub hand-held faucets, in addition to the static faucets. 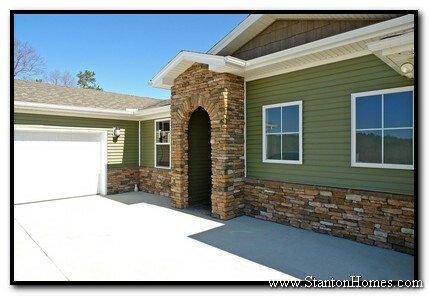 What's the Difference Between Universal Design Homes and Accessible Homes? 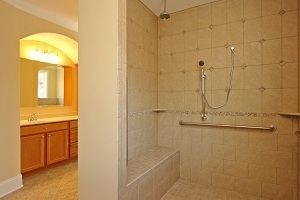 Universal Design homes are intended for easier living, no matter what physical condition, age, or ability. 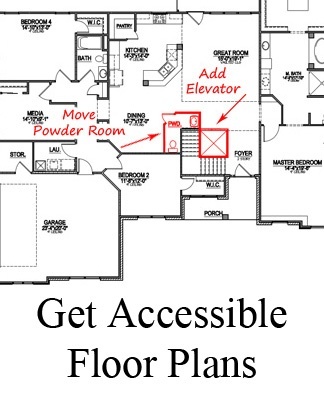 Accessible homes must meet higher, more specific standards (especially when government funding is utilized to build the home). 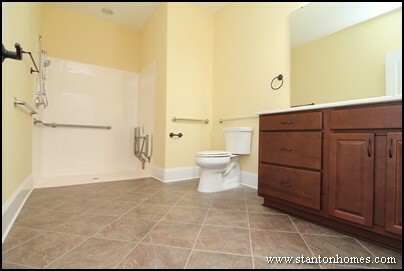 For example, for a home to be accessible, not just universal, the turning radius in the bathroom must be 5 feet in diameter. 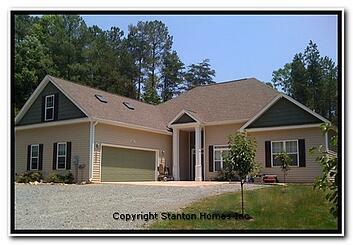 Each universal design home is different. 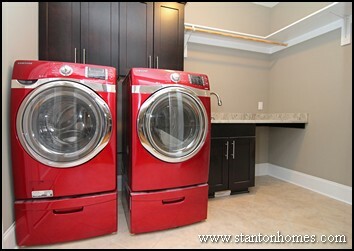 Not every feature is included in every home - you'll choose what's most important to you and your lifestyle. 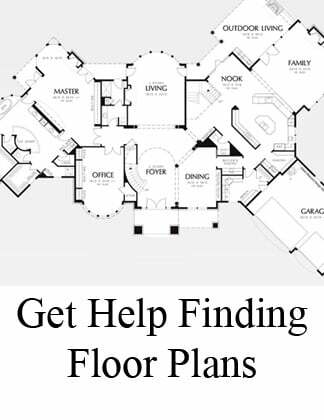 The best time to add universal design to your home is in the planning stage, before the building process begins. Ask us how! 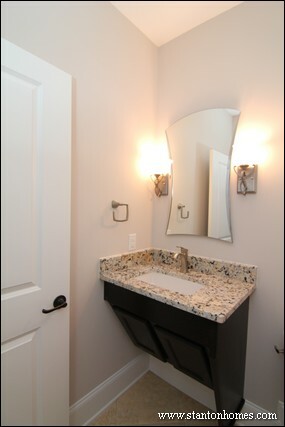 A Universal Design home is focused on ease of use and flexibility - for homeowners of any age, status, and abiltiy - for safety and comfort in a home that does not sacrifice visual appeal. 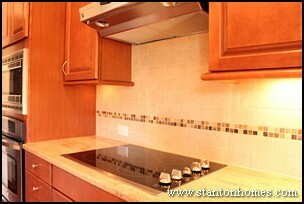 Induction cooktops - there are no open flames to worry about. 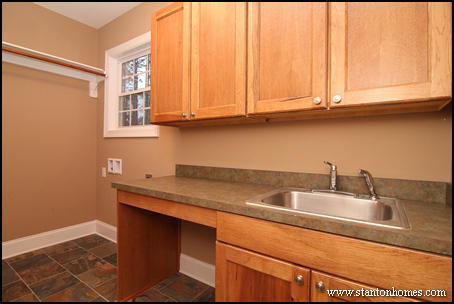 Empty space under (or lower placement of) countertops, sink, or cooking areas - allows for seated (or wheelchair) access. 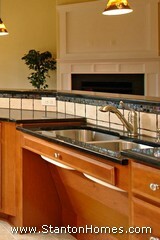 Adjustable-height countertops - provides more flexibility for various kitchen users. 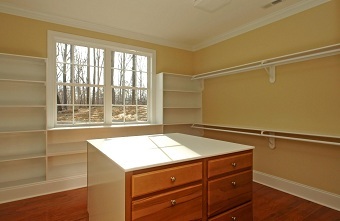 Roll-out shelves or drawers - allows visibility and easy reach. 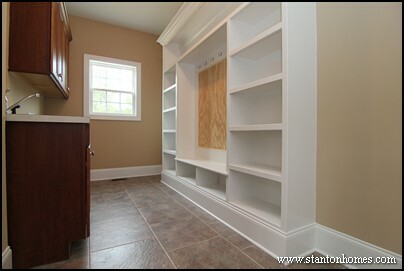 Pull-out counter underneath a built-in wall oven - allows easier transfer of hot items. Hands-free, single lever, or pull-out spray faucets - each gives more flexibility to the user with little arm strength. 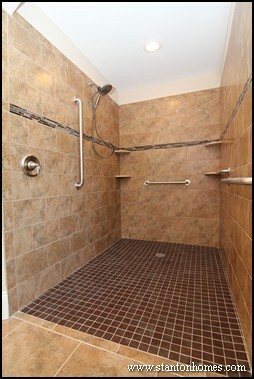 "Zero-threshold" shower bases - the shower entrance is flush with the bathroom floor, allowing for wheelchairs and generally easier access. 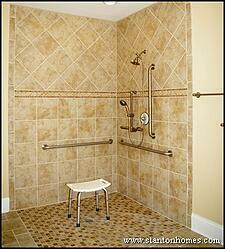 Grab bars - manufacturers now offer coordinating grab bars, faucets and shower fixtures. 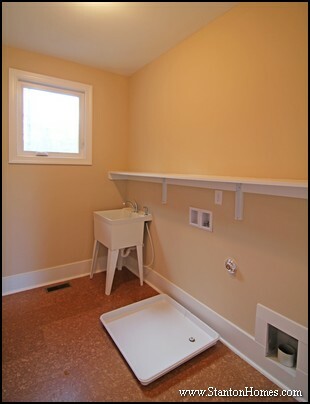 Tub ledge or seating area - easier movement into and out of the tub. Removable flip-up bench - can be used in the tub or shower. Night lighting - to help safely navigate a dark room. 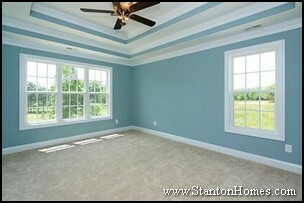 Contrasting color design - to help distinguish where surfaces change. Is Universal Design Right for You? 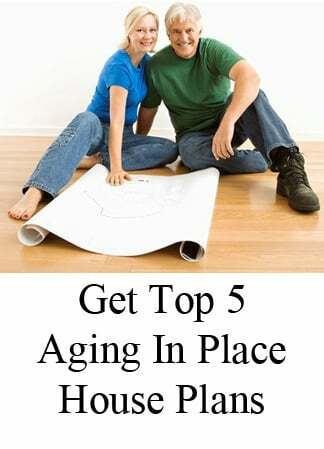 These kinds of features help your home adjust to changing needs over the years as your family grows, you care for elderly relatives, and you even grow older, yourself. 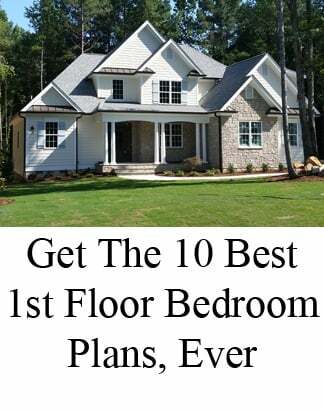 The more you consider as your new home is built, the less you will need to remodel later – and the more you will enjoy your home for years to come.